Prospective students toured a building at Merrimack College. NORTH ANDOVER — Across the country, from New Hampshire to Kentucky to California, small private colleges are struggling. They’re merging with neighbors, cutting programs and staff, and offering steep tuition discounts to get students into seats. Some are going out of business altogether. But Merrimack College, in sleepy North Andover, has recalibrated its approach to move away from the traditional liberal arts offering — and the strategy is working. By stressing health sciences, business, and engineering over humanities and by tailoring its financial aid to attract high school graduates that best fit the small school, Merrimack has managed to boost student enrollment, build facilities, and stabilize its finances. The result leaves Christopher Hopey, the college president, unusually chipper. Merrimack College is among a cohort of small, private institutions that have avoided drastic financial steps, despite the shrinking number of college-age students and growing resistance from families unwilling to go deep into debt for private college when a public institution will do. And it is succeeding in Massachusetts, where competition is especially stiff, with about 90 four-year private and public schools that families can select. Merrimack — a Catholic college that started out as a commuter school for returning GIs after World War II and is best known as a small, ice hockey powerhouse — has found its footing, said Pranav Sharma, an analyst for Moody’s Investors Services. The solution at Merrimack has been multifold but has focused on shifting from the basic liberal arts track to one geared toward degrees with clearer job prospects in the current economy. For years, Merrimack offered its students a wide array of classes from philosophy and English to education, political science, and business management. 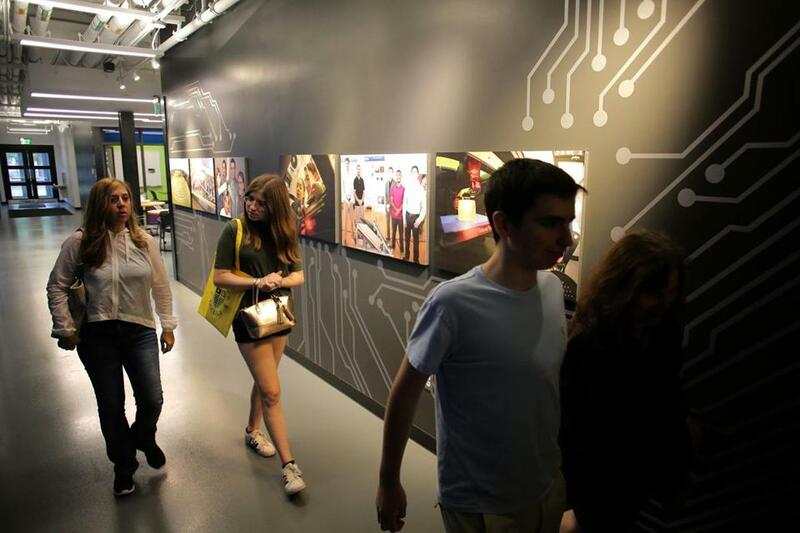 But in recent years, it has built up its courses and lab spaces in health sciences, finance, and engineering, in the hopes of competing with the likes of the University of Massachusetts Lowell and Wentworth Institute of Technology. Science, technology, engineering, and mathematics, called STEM fields, have become increasingly popular at colleges and universities nationwide as budget-conscious students gravitate to degrees most likely to land them jobs after graduation. And in an environment in which most colleges are chasing the best and brightest, Merrimack has courted B students who are eager to attend; most of its students are from Massachusetts. The sticker price at Merrimack was $55,620 last year, but with scholarships and financial aid most students pay about $33,000 on average. That puts Merrimack between other small private colleges in Massachusetts, such as Endicott College and Stonehill College, according to the US Department of Education. Merrimack has worked to convince families that it’s money well-spent, highlighting partnerships with businesses, such as Raytheon Co. and New Balance, where students work and do internships, Hopey said. Merrimack president Christopher Hopey expressed optimism. The average earnings of a Merrimack student a decade after graduating are about $56,000 a year, above the national average of $33,500. Many other small colleges are also trying their hand at reinvention, hoping to weather the shifting market. Earlier this summer, Wheelock College in Boston’s Fenway neighborhood put its president’s house on the market and planned to sell a dormitory. It said it was examining its financial options, including eventually eliminating undergraduate degrees altogether. Colby-Sawyer College in New Hampshire is eliminating its English and philosophy majors this year in favor of programs such as nursing, business, and sports management. Simmons College in Boston has turned to online graduate programs to boost enrollment and revenue. Schools such as Wentworth in the Fenway, which already have a strong presence in STEM education, have expanded to offer more profitable graduate-degree programs and are also marketing to more international students in Asia and the Middle East. Still, Merrimack’s efforts seem to be yielding results. 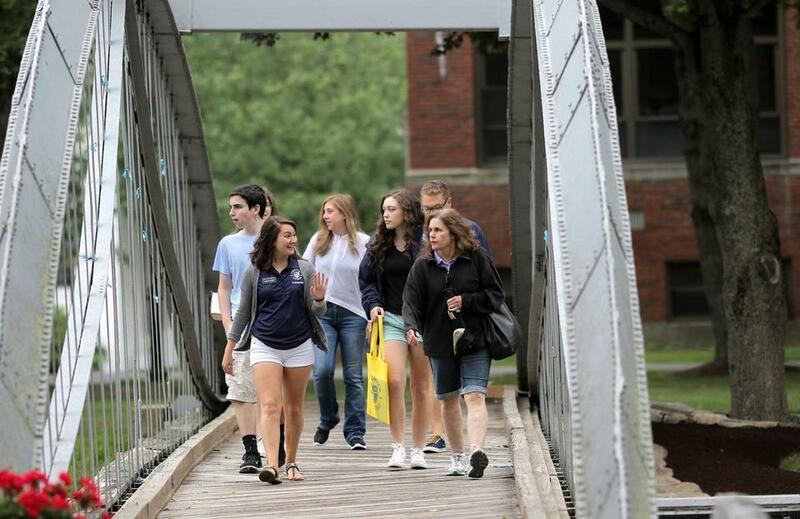 Prospective Merrimack students crossed the Moseley Iron Arch, the state’s oldest iron bridge. 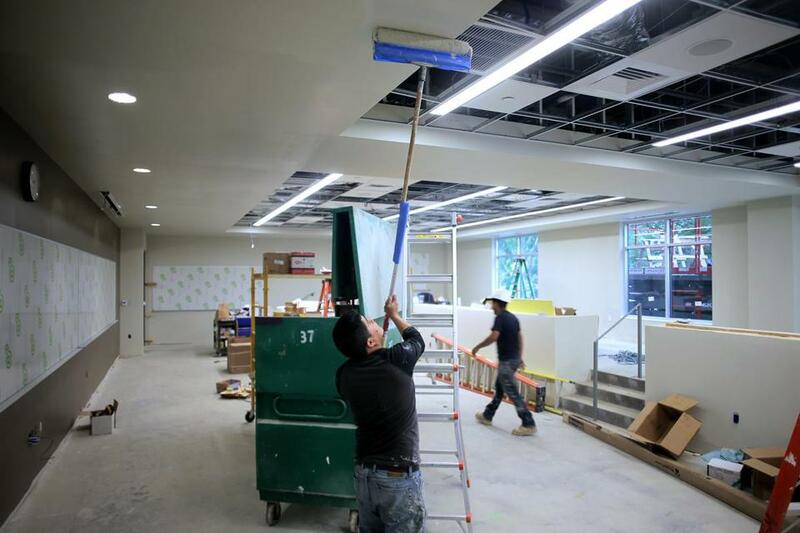 This summer the campus is teeming with construction workers who are building a track and stadium and a tutoring center on the library’s third floor, and finishing a new business school. The school’s finances have improved in recent years, earning an upgrade for its debt from Moody’s Investors Services from negative to stable. The school’s endowment grew from $35 million in 2011 to $50 million in 2015. For Sara Puglielli, 17, a rising high school senior from Connecticut who is on the college tour circuit this summer, Merrimack’s combination of business and liberal arts placed it on the list of potential schools, along with Bentley University and Babson College, long-standing campuses for business majors. But convincing some families that a Merrimack degree is worth the price is still a challenge. 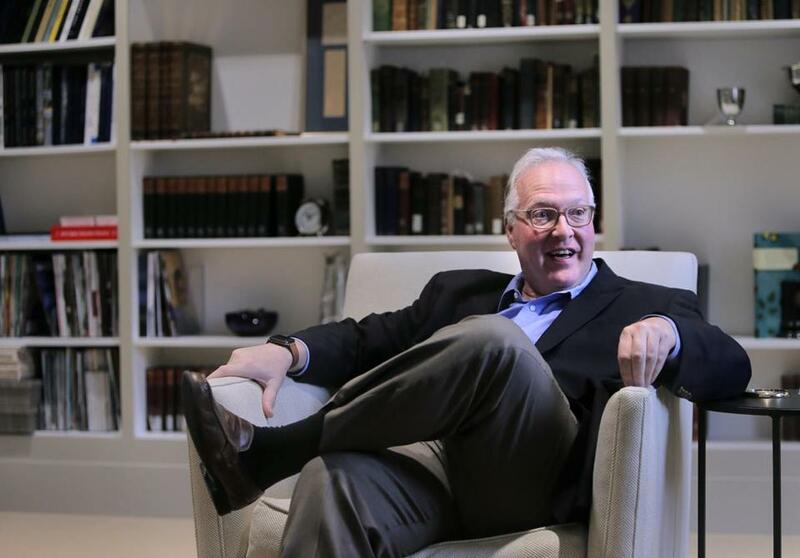 Malcolm Frampton — who brought his 17-year-old son Jackson to Merrimack for a recent tour — said for the price tag, the college still lacks some amenities that many other public and private schools offer, such as fully-updated dorms, a large library, and generous meal plans. “We are considering colleges that are $20,000 less that still offer much more than Merrimack,” Frampton said. Ultimately, small colleges face an uphill battle, said Alice W. Brown, a North Carolina-based higher education consultant who used to lead the Appalachian College Association, a group of private liberal arts schools. And Merrimack’s path may not work for all small colleges, she said. Just adding more STEM-related courses is likely not enough to stand out in a crowded market, Brown said. Construction continued at Merrimack’s Crowe Hall academic pavilion.